For many soldiers, the battle does not end when they come home. They carry both physical and mental scars with them when they return. Trying to live with those traumas can be as difficult as anything they had to do while serving. 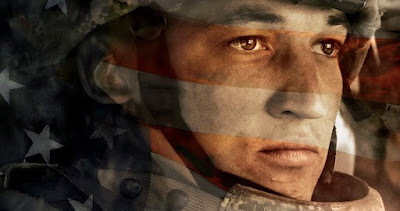 The based-on-fact drama Thank You for Your Service, adapted from the 2013 nonfiction book of the same name by David Finkel, is a well-meaning, and occasionally harrowing, account of men attempting to adjust to life outside of the military. As the film begins, Adam Schumann (Miles Teller), Tausolo (or Solo) Aieti (Beulah Koale) and Will Waller (Joe Cole) come back from Iraq to very different situations. Adam has a wife, Saskia (Haley Bennett), a young daughter and a baby boy he has never met. Solo has a pregnant wife, Alea (Keisha Castle-Hughes). Meanwhile, Will returns home to find that his fiancée has left him and cleaned out his place. All of these situations are made more complicated by the PTSD these men are suffering from. They all carry difficult memories with them and the combination of guilt and the fear they will never be free of what they have experienced makes them feel hopeless. It seems that the main purpose of Thank You for Your Service is to make more people aware of what the men and women returning from the military have to deal with when they get back. The main message running through the film is that these people should seek help of some kind in dealing with what they have been through, but that help is usually not as easy for them to access as it should be. There are moments when I felt the movie was a little overly preachy with its message. What it has to say is important, but there are a few scenes where writer/director Jason Hall uses a sledgehammer instead of a scalpel to make his point (especially the scenes involving unsympathetic superior officers). The quiet moments are the ones that work the best. I just know that Oscar is around the corner! Miles Teller (who showed up just last week in the firefighter drama Only the Brave) is very good at portraying Schumann’s inner struggle. Guilt for a couple of incidents in Iraq that he feels responsible for is eating him alive. The best scenes in the film are the ones between him and his worried, but incredibly supportive, wife. They could have gone the cliché route and had her be a nag who does not understand why her husband is behaving the way he is. Thankfully, that is not what they did. Haley Bennett more than holds her own as a strong woman trying her best to help the man she loves who lost a part of himself in the Army. Solo’s story is far more melodramatic. He suffered an injury that has caused memory loss and, though he wants to return to service, they will not take him back. This leaves him completely lost and hopeless and leads to him making some very bad decisions. All of this may have actually happened, but it does not come off as believable here. His scenes seem manufactured to add unnecessary suspense and took away from the message of the film. Overall, however, that message lands well enough. The performances are good (especially Teller and Bennett) and Hall is generally successful at making his point in a story that needs to be told. I find with many films I like that, after some time has passed, my memory edits out the parts I did not like. I feel like that is what will happen with Thank You for Your Service. I will forget about Solo’s narrative and the more on the nose moments where the soldiers are neglected by those who should be trying to help them. Instead, I will remember Adam and Saskia Schumann. Their story is the movie I liked.